R-Series compressors are loaded with rugged features designed for day-in, day-out performance. Delivering high performance and tremendous value, R-Series compressors offer long, trouble-free service with unbridled operating efficiency. Gasketless design eliminates the possibility of blown head gaskets for leak-free operation. Aluminum alloy first-stage piston is weight matched to the cast iron second-stage piston, ensuring proper balance. Three compression rings and one oil control ring provide excellent oil control, minimum blow-by and high efficiency air delivery. Tapered roller-type main bearings provide full contact and support of the crank plus delivers the longest possible life. 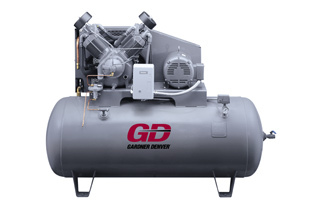 Many options are available to help you develop a Gardner Denver compressor package that exactly matches your specific operating requirements.